Start praying over your child's prayer life immediately. It's, never to early or, to late to start. You can pray that the Lord blesses your child's prayer life and, that He put's a desire within them to want to pray and build their own relationship with Jesus. Your child's bedtime routine is the perfect time to introduce praying in a gentle way. It's the quietest time of the day and your child is beginning to wind down. And, you have their full attention with no distractions. The benefit is that prayer has a calming effect, and it will help your child to fall asleep better, too! When your child is young they can listen to you praying out loud. Once, they can start to say a few words then, they can join you in prayers together. Once, they are able to talk well on their own then, they can take over their prayers when they want to. They will let you know when their ready to take over and, when they want you to help them. This could change nightly for years until, they now longer want you hearing their prayers. That day will be a very sad day! Enjoy every precious prayer that you get to share in now!! 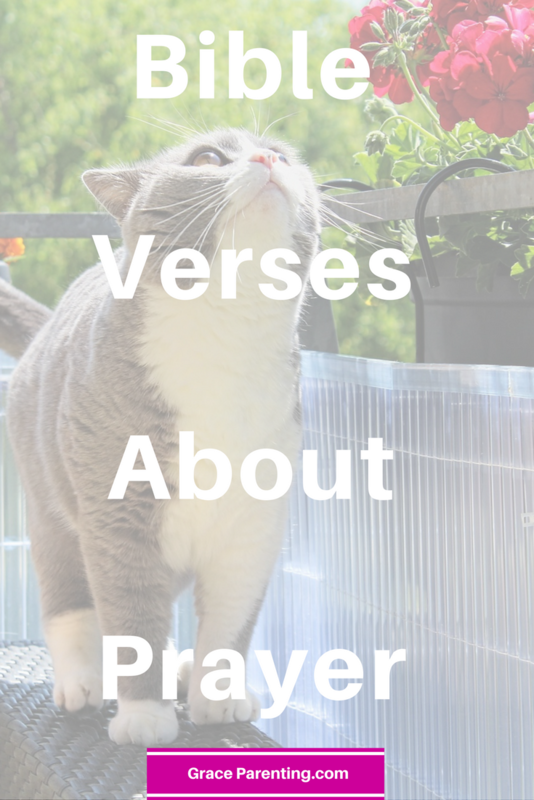 Here are some simple bible verses that talk about prayer. They talk about how to pray, when and where to pray and what to pray about. You can use these to help you explain what the bible says about prayer to your children. The eyes of the Lord watch over those who do right, and his ears are open to their prayers. But the Lord turns his face against those who do evil. In those days when you pray, I will listen. If you look for me wholeheartedly, you will find me. Let your kids see you praying: A quick thank you Lord for a parking spot or, a full on prayer of protection before leaving home, let your kids see that prayer is a way of life. Use a gentle approach with kid friendly objects: Many children learn better with physical objects to help them learn. There are many cute teddy bears and story books you can use to teach your children about prayer. Encourage your kids to pray with you: Gently guide your child through a bedtime prayer each night. You can encourage your child to pray the prayer out loud with you i,f you have the same prayer each night. Give your child prayer suggestion: A great way to do this is with a simple prayer jar or box. Decorate it and, put the names of people you want your child to pray for inside your container. Each night, let your kids pull out a slip of paper and, pray for that person. Keep a small zip-lock bag or us a paperclip to hold the names of the people your child has prayed for. Once, they have all been prayer for then you put them back into the pick a prayer pile again and repeat the processes. Help shy kids concur prayer paralysis: You start the prayer with the name of someone you want to pray for like grandma and have your kids add to your prayer. Like this; "Dear Jesus, I pray that you for grandma she is so kind and loving" .... then have your child add something they love about grandma after. Or, you could say; "Dear Jesus, I pray that you bless Daddy with good sleep tonight".... then have your child add something they would like God to bless Daddy with. Once you start the prayer you will often find that your child is full of idea's but if not you can just give them a quick idea but make sure you let them pray it. Give testimonies of answered prayers: When a prayer that your child has prayed for has been answered, talk about it with you child, and give thanks to the Lord together. Talk about how God answered the prayer. This is usually not in the way that we expect our prayers to be answered but, how Jesus chooses to answer our prayers. Let your kids learn that even when God doesn't answer prayer how we desire him to, He is still faithful to answer them. Also, that His answer is even better then what we prayer for. You can get your child to share their testimonies of answered prayers to dad or grandma, too. Or, make it a tradition that once a week, at the dinner table, each person gets an opportunity to share about one prayer that got answered that week. What do you do if your child has no answered prayers yet? - share some of your own testimonies of answered prayers. - talk about someone else's testimony of healing or answers to prayers. - Read stories from the bible that talk about people receiving answered to prayer. Like the story of Ester, her prayers were answered and the Jews were saved from death. Or, Moses prayers helped God's people to be set free from slavery. And, of course their are the many miracles that Jesus prayed for, such as, turning water to wine and healing people sicknesses. The bible is full of answers to prayer you won't find any problem find ones that your child will like. Write it Down: Start a prayer journal for yourself and, let your kids start their own, too! If, they see you doing it, they will think it's more important and they will be inspired to keep their own journal, too. No matter what age they are! You can plant many types of seeds to help your children grown into mighty prayer warrior's! Keep prayer stress free and fun, not a chore that must done. Your kids will love this time with the Lord! And, it will turn into their most favourite time of day. One because, they with get to spend time with you, their most favourite person. And, two because, the Lord will bless their prayers and, they will begin to build a strong relationship with Jesus!! 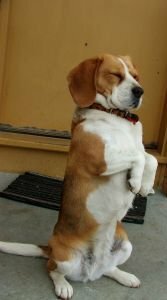 Bonus: Just Plain Old Cute Praying Dog!! Please, please, please, hear my prayer.... please, forgive me, I couldn't help myself. The garbage just smelled so good and, the neighbours cat well, you already know how I feel about that supper clean and always sooooo perfect feline. Lord please, help me change and, if you could get my owner to give me a little of her dinner, well, I would be forever grateful!